As one of the most important times in the Christian calander there is a rich tradition of music for Easter including for Ash Wednesday and Lent, Passiontide, Palm Sunday, Maundy Thursday, Good Friday, and Easter Sunday. We offer here a selection of arrangements which celebrate this special period. Volume IV of Seasonal Carols Old & New is an exciting new venture into previously unexplored territory. Apart from a small number of Easter carols, there has been little music available for festivals other than Christmas. In Seasonal Carols Volume IV all the main seasons are represented, and in addition festivals such as Corpus Christi, Candlemas, The Transfiguration of Saints' Days receive timely attention. As a complete contrast and in a secular vein, a new rustic mixedvoice arrangement of King Henry VIII's "Pastime With Good Company" has been added. This volume is intended to give churches, schools and colleges a wide selection of material that will help to add a richer feeling to a liturgically - based Christian year. This collection aims to provide a comprehensive survey of a highly significant part of the Christian Year: Ash Wednesday and Lent, Passiontide, Palm Sunday, Maundy Thursday, Good Friday, and Easter. Its contents span all musical periods of what is a marvellously rich area of church music and it contains much that is not widely available elsewhere under one cover. Ash Wednesday to Easter for Choirs includes a number of less familiar works together with new or recent arrangements of well-known tunes, such as Philip Ledger's 'This joyful Eastertide', Simon Lindley's 'Now the green blade riseth', and Bob Chilcott's setting of 'Were you there?'. Some of the anthems, for example Richard Shephard's 'Sing, my tongue' and Grayston Ives' 'Ride on', have been newly commissioned specifically for this collection, thus filling certain gaps. Wherever possible new practical performing editions of 16th-century repertoire have been prepared, reflecting current scholarship and including an English singing translation and, where, the original had none, a dynamic scheme. Such dynamics are the editors' suggestions only and may be freely ignored or adapted. Note values have in some instances been halved. Unaccompanied items include keyboard reductions for rehearsal. Taken from the first arrangements on which Robert Shaw and Alice Parker collaborated, these titles were selected from hundreds of familiar and forgotten works for their musical and poetic excellence. The arrangements were made as simple as possible in order to let the words shine through the choral tone and texture while achieving variety from changes in voicing in a constant effort to reflect the most subtle articulations of the text. The earliest song in this collection is the ancient chant "Christ the Lord Hath Risen." Other familiar hymns come from the sacred tradition: "The Strife is O'er," and "O Sons and Daughters." The re-telling of the Easter story, and the joy of the Easter season, should shine forth through the singing of these songs. Listen, re-enact and give voice to the central mystery, in order that all who hear may join the celebration. Who needs the piano when the voices sound this good on their own? Joseph Graham and David Angerman provide a real winner with this unique approach to the Easter celebration. The highly animated original gospel tune "Hear The Music! Jesus Is A-Risen!" makes use of the traditional spiritual My Lord, What a Morning! but turns the text a bit to make it ideal for Easter acclamations. Here is a classic approach to the quintessential Christ the King anthem "Crown Him With Many Crowns". An a cappella section and verse with descant color this anthem for a spectacular presentation. There are lots of options with this ideal opener or congregational participation number. Written in Haitian "rara" style, Alelouya by Emile Desamours captures the celebratory nature of this musical style in an exuberant anthem proclaiming Christ's resurrection. Sung a cappella in the Haitian Creole dialect with finger snaps and tongue clicks, the joy and ecstasy of Easter overflow. For choirs that may find the Haitian text a bit too challenging, Alelouya will also be very effective performed using the English text. This is a truly electric piece! The useful collection of a cappella benedictions "Three Linten Benedictions" from David Angerman and Barbara Furman is especially designed for use during Holy Week and Lenten services. There is not much service music devoted to this important time and this needful trio will be helpful indeed. The organ may quietly play with the singers for ease of performance. Introspective. The vigorous vocal fugue, sung a cappella, would make a dynamic worship opener for Easter. Written in classical style, the opening vocal lines imitate a trumpet fanfare. Descriptive text and evolving layers of color and texture make this fresh resurrection anthem a true delight. The title says it all... "Easter Song of Triumph". 'Choral Sentences for Holy Week and Easter' includes four "choral pictures" suitable as introits or short anthems. Palm Sunday- patient, plodding donkey carrying Jesus into Jerusalem; Maundy Thursday-prayerful petition; Good- plaintive melody with mournful accompaniment; Easter- women trudging to the tomb only to discover that Christ has risen! Based on PETERSFIELD (Harmonia Sacra, 1832), 'Savior, Prince of Israel's Race' has open harmonies with Sopranos and Tenors singing melody, reflectin early American compositional/singing style. The premise of 'Mary Wept' shows the strength of Mary in the adversity she suffered on Good Friday. Smith's 'Easter,' an arrangement of Ralph Vaughan Wiliam's composition, is a quiet and sensitive Easter anthem. Crisafulli's 'Come Away to the Skies' is a beautiful piece. Each stanza has a different setting. Useful throughout Easter season! "A" sections of 'I Am the Resurrection' feature rhythmic repetition of title. Reflective "B" section includes homophonic and polyphonic writing of Christ's promise: "Whoever lives and believes in me will never die." 'Jesus Died On Calvary's Mountain' is a plaintive American folk-tune. It has a poignant 3-stanza setting with different vocal texture for each stanza. 'A Nobler Life' is a straight-forward chorale style setting combining two Thomas Kingo texts. 'Lord, Who Throughout These Forty Days' is an easily remembered new "American" tune. The melody is shared by men and women's voices in alternating stanzas of this Lenten anthem. Comfortably performable by a small or larger choir with optional solo. Written for the National Lutheran Choir, 'A Lenton Meditation' is a simple, yet lovely treatment of the familiar Johann Heermann hymn. The piece begins with the fourth stanza (For me, kind Jesus?) which quickly brings the listener to the heart of this beautiful text. The change in stanza sequence has a powerful affect in giving a meaningful new interpretation of this hymn. Michael Barrett : Go, Mary, Go! Something refreshing for your Easter and post-Easter worship celebrations! Harkening back to early folk/rock styles, this anthem sets toes tapping from note one! A touch of urban gospel in the accompaniment establishes the vocal dialogue that characterizes the theme. Opportunities for multiple solos in a call and response sequence add variety and the choral ostinato transitions to the ending for a really special moment. Pure joy! Not just for Easter, this song connects the resurrected Christ with our own miracle of eternal life and finds the redeemed claiming the light and life of this spiritual gift. Musically infectious, the tune moves forward with marked syncopations and repeated gestures that immediately connect. Wonderfully adapted for choir, this is sure to be a favorite! Rejoice in this timeless truth, I have resurrection power living on the inside. Jesus, You have given us freedom. Score and Parts (perc 1-2, pno, syn, gtrs/b, dm, vn 1-2, va, vc, db) available as a digital download. Wow! This is a must-have anthem for every choral library. Joseph Martin provides two great texts - one for Easter and one for general worship - both of which are brimming with dazzling imagery and unbounded joy. The lilting, dance-like accompaniment moves the piece along so deftly that the song seems to end too soon. A Resurrection Acclamation is a thrill for both choir and congregation. Uses: Easter Scripture: John 20:1-9; Matthew 27:64; Romans 1:4 The joy of Easter is revealed in this buoyant 6/8 Easter affirmation. The celebrated Ode to Joy tune is re-metered to create a lilting dance-like effect that is quickly endearing to the listener. A refreshing piano accompaniment mingles with a bright trumpet descant to complete the package! Uses: Easter, Eastertide Scripture: John 1:1-18; John 20:19-23; Mark 16:1-8 Joy abounds in this solid new resurrection paean featuring a confident contemporary sound that's sure to please. Fashioned specifically for Easter morning praise, you will find this new choral song a pleasing affirmation to declare the risen Lord. Accessible ranges and good piano support ease the learning curve on this winner. Available separately: SATB, LiteTrax CD. Duration: ca. 3:16. John Parker and Robert Sterling have created this meaningful and flexible work in celebration of Holy Week and Easter. You will find the individual pieces within this collection appropriate for Palm Sunday, Maundy Thursday, Good Friday and Easter Sunday, or they may be presented as a complete work for any Holy Week service. - Small instrumental ensemble adds interest and color. - Complete narration included to enhance the presentation. - Pieces are usable as stand-alone anthems. Available separately: SATB, Preview CD, ChoirTrax CD, CD 10-Pak, Preview Pak. Instrumental Score and Parts (fl, ob, hn, vc, perc, timp, glock, handbells) available as a Printed Edition. Duration: ca. 20:00. Vivaldi's Gloria is given a new role as and Easter introit in this concept for Resurrection morning. A brief excerpt from the masterwork is re-tooled with new words, announcing the risen Christ with classic grace. Energizing and brilliant with purpose, the appeal of this popular melody is universal. Charles Wesley's familiar and timeless text is found in this inspired new setting from Susan Naylor Callaway. The beautiful brief a cappella section moves quickly to a satisfying and broad final verse. Perfect for any time during Lent or Easter, this is a simple and tender offering of sacrifice. Celebrate the resurrection with And the Son Arose, a compelling 25-minute musical for Easter. Through the eyes of those who witnessed the ministry of Christ first-hand, the musical unfolds with a blend of classic Easter hymns, new songs and contemporary favorites... all framed with the timeless words of the Gospel.Available separately: SATB, ChoirTrax CD, I-Pak (Chamber Orchestra), I-Pak (Full Orchestra), Preview CD, CD 10-Pak and Preview Pak. Nancy Price : Arise! Arise! This new offering from Ruth Elaine Schram is perfect for the Easter season. Beyond the pain, there is hope; beyond the cross, there is life. Beyond the grave, there is glory, behold our risen Lord. The piano and cello accompaniment enhance the message of the powerful text.Available separately: SATB. Approx. Performance Time: 4:00. John Parker : Can't Keep That Glory In! There is an effervescent spirit to this new spiritual from David Lantz and John Parker. The Easter event will erupt with unbounded joy as the rhythmic energy of this well-crafted gospel piece echoes through the hearts of the choir. This will become a favorite! Uses: Easter, General, Praise Team Scripture: Matthew 27:64, Luke 24:34, Mark 16:6 This contemporary styled hymn has a traditional celtic feel. A characteristic piano accompaniment establishes the spirit of the score and the weighty words celebrating our unity in the resurrected Christ demand a praise-worthy response. Excellent for Eastertide, this powerful declaration of faith calls the listener to join the song and lift one voice of unified praise. Easter standards find a home together here in Gary Lanier's setting for a festive resurrection morning celebration. Titles include: Christ the Lord Is Risen Today and Christ Arose. Available separately: SATB, ChoirTrax CD. Brass score and parts available digitally (tpt 1 tpt 2/3, hn tbn 1, tbn 2/3, perc, timp). Duration: ca: 2:40. This vigorous vocal fugue, sung a cappella, would make a dynamic worship opener for Easter. Written in classical style, the opening vocal lines imitate a trumpet fanfare. Descriptive text and evolving layers of color and texture make this fresh resurrection anthem a true delight. The title says it all... Easter Song of Triumph. Uses: Palm Sunday Scripture: Matthew 21:1-11; Mark 11:1-11; John 12:12-19 A classic touch adorns this Palm Sunday anthem coupling a well-respected hymn tune with the celebrated theme by Mouret, made famous as the theme of Masterpiece Theatre. A shining example of the elegant blending of two styles into pleasing unity, the subject matter and incorporation of children make this as useful as it is beautiful. Not beyond the comfort range of the developing choir, this choral will be welcome in church music programs of any size. Trumpet part and children's choir part included. Uses: Maundy Thursday, Holy Week Scripture: Matthew 26:36-46 From the Getty/Townend writing team comes a heartrending expression of Christ's prayerful vigil in the Garden of Gethsemane. Replete with word painting, this impressionistic offering will enhance Maundy Thursday services with expressive potential. Cello part included. Duration: ca. 4:34. Superb Eilers! A perfect Easter benediction! Available: SATB a cappella. Uses: General, Ascension, Christ the King, Eastertide Scripture: Psalm 47 The poetic imagery of this Psalm makes it usable not only as a general anthem but also for Ascension, Eastertide or Christ the King Sunday. The festive brass and percussion parts added to the organ make this an anthem of great impact. Mixed meter sections dance with more lyric passages as the anthem develops, and a very special wall of sound section is an outstanding moment of choral virtuosity. We are proud to now offer this proven winner for men's voices! Score and Parts (tpt 1-2, hn, tbn, tba, timp) available as a Printed Edition. Great Joy in the Morning! With a driving contemporary flavor, Great Joy In the Morning! is a festive Easter morning anthem. Mark Brymer provides some nice harmonic surprises and John Parker's text is sheer exuberance. From the subdued beginning, the anthem builds to a stunning finish. Energetic! Available: SATB, Instrumental Pak (Orchestra), ChoirTrax CD. "Wake up, world! Hear the wonderful story..." What a happy, spirited anthem! This contemporary spiritual from the team of Nancy Price and Don Besig is an a cappella offering for your Easter service. Easily learned, the joyful refrain could even be taught to the congregation. Refreshing and memorable, Hallelujah, Sing with Glory! is positively a song of great joy! Philip Bliss : Hallelujah, What a Savior! This perennial Easter text is given new life with an original tune and setting. Approriate for Good Friday, as well. Available separately: SATB, ChoirTrax CD. Score and parts (fl, ob, cl, tpt 1-3, hn, tbn 1-2, tbn 3/tba, perc, timp, vn 1-2, va, vc, db) available as a CD-ROM and as a digital download. Duration: ca. 5:30. Uses: General, Easter, Eastertide, Youth Choir, Praise Team, Blended Worship Scripture: Matthew 28:1-8; Mark 16: 1-8; Luke 24:1-9 Here's a great crossover piece that will appeal to many different worship styles! Two giants of the contemporary worship scene, Paul Baloche and Graham Kendrick, join together on this exciting resurrection proclamation. Primal in its power, this simple statement of faith captures the moment of that most glorious morning. Unforgettable! Score and Parts (rhythm, vn 1-2, va, vc, db) available as a digital download. Uses: General, Easter, Eastertide, Youth Choir, Praise Team, Blended Worship Scripture: Matthew 28:1-8; Mark 16: 1-8; Luke 24:1-9 Now available for SAB! Here's a great crossover piece that will appeal to many different worship styles! Two giants of the contemporary worship scene, Paul Baloche and Graham Kendrick, join together on this exciting resurrection proclamation. Primal in its power, this simple statement of faith captures the moment of that most glorious morning. Unforgettable! Score and Parts (rhythm, vn 1-2, va, vc, db) available as a digital download. Joseph Graham : Hear The Music! Jesus Is A-Risen! Who needs the piano when the voices sound this good on their own? Joseph Graham and David Angerman provide a real winner with this unique approach to the Easter celebration. This highly animated original gospel tune makes use of the traditional spiritual My Lord, What a Morning! but turns the text a bit to make it ideal for Easter acclamations. Already a classic worship song of our generation, I Will Rise is effectively paired here with Darlene Zschech's Worthy Is the Lamb for a powerful presentation on Easter or any service of high praise. This is a Harold Ross arrangement you can't miss. Available separately: SATB, ChoirTrax CD. Score and parts (tpt 1-3, tbn 1-2, tbn3/tba, rhythm, vn 1-2, va, vc, db) available as a CD-ROM and as a digital download. Duration: ca. 5:55. Uses: Holy Week, Lent, Maundy Thursday Scripture: Mark 14:32 Set with artistry and refinement, this classic Lenten hymn is caressed with expressive elegance in this impressionistic arrangement. A spotlight piano accompaniment supports the emotive direction of the piece and weaves a winsome atmosphere that effectively holds this time-honored poem. Moving! Contemplative and mournful in nature, this marriage of text and music will be a meaningful backdrop for Good Friday or any service of the cross. Available separately: SATB, BonusTrax CD. Score and parts (fl, vn 1-2, va, vc, db) available as a digital download. Duration: ca. 2:50. Uses: Easter, Introit Scripture: Matthew 28:6; Luke 24:6; Romans 8:34 One of the most prolific hymns in our sacred songbook is given a fresh look in this adaptation. Moving with confidence in 6/8, an opening fanfare calls your Easter celebration to glorious purpose. A brief presentation time makes this anthem a superb Introit. Easy to learn... but hard to forget! Rollo Dilworth : Jesus Rose! With the pleasing lilt of 3/4, this celebrated writing team awakens the Easter event with a jubilant call to life. Jesus is Risen is the herald and a spirit of joy permeates every measure. The inclusion of the beloved Come, Ye Faithful, Raise the Strain is refreshing. A rousing piano part dances through this anthem that is a perfect opening for resurrection morning. Uses: Palm Sunday Scripture: Zechariah 9:9; John 12:12-15; Matthew 21:5 The triumphal entry is announced with all of its pomp and regality in this re-tooling of a time-honored hymn tune, typically associated with Easter. Perfectly at home in its new clothing, this theme epitomizes jubilation and praise. Fanfare-like episodes connect sturdy a cappella sections and fully orchestrated crescendos, bringing the whole song to dizzying heights. 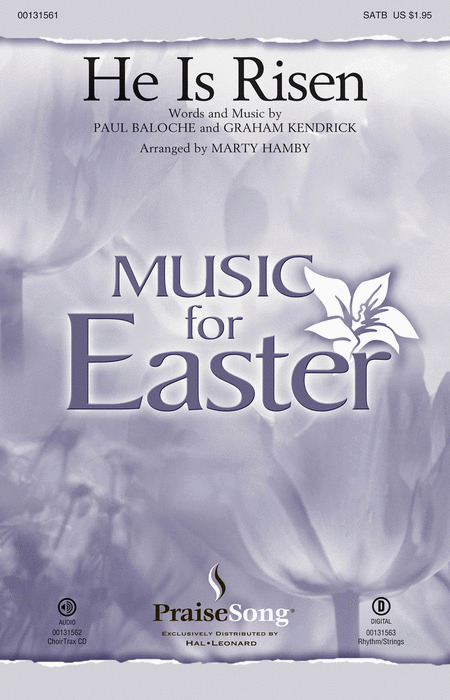 Uses: General, Easter, Eastertide Scripture: Luke 23:33; John 19:30 Now available for SAB choirs, this bestseller is set in a style reminiscent of a Celtic hymn. This resolute storyteller approach brings the listener close. With each verse there is a crescendo of purpose, showcasing the power of the cross and the sacrificial love of Christ. Truly inspired! Score and Parts (fl 1-2, ob, cl 1-2, bn, tpt 1-3, hn 1-2, tbn 1-2, tbn 3/tba, perc 1-3, hp, rhythm, vn 1-2, va, vc, db) available on CD-ROM and as a digital download.